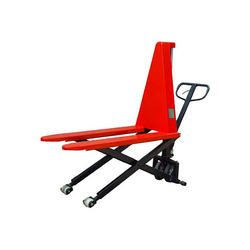 Manufacturer of a wide range of products which include hydraulic reel pallet truck, high lift pallet truck, drum handling truck, pallet truck, hydraulic hand pallet truck and hydraulic high lift pallet truck. Steering wheel ( mm ) 200 dia. We are one of the leading suppliers of high-performance Hydraulic Reel Pallet Truck that are widely used for easy movement of paper rolls from one place to another. It has a sturdy body with a compact design. 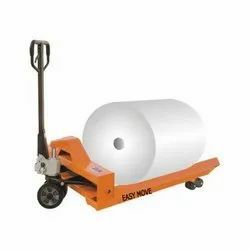 This heavy-duty paper roll pallet truck is outfitted with a single piece tempered fork that ensures high strength. 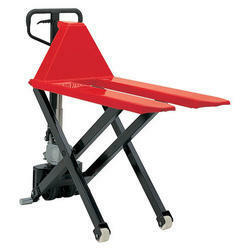 Hydraulic Reel Pallet Truck facilitates in the smooth and easy movement of warp beam or rolls. The beam flanges are rested on the trolley while transporting. Hydraulic Reel Pallet Truck is widely used for easy movement of paper rolls from one place to another. 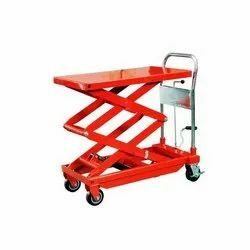 We offer a High Lift Pallet Truck that is used as lifting tables to lift material from different heights. Designed as per the international standards, these can be modified to suit the specific requirements of the customers. The piston is polished and hard chromed and the unit has high-pressure polyurethane seals 800 / 1000 kg capacity hand pallet truck. High lift pallet trucks are easy to pull chassis - Ideal for regular light duties and in the back of lorries. Powder coated paint finish for longer life. 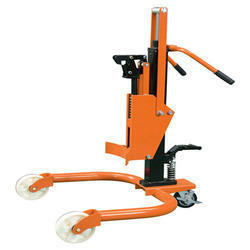 High lift pallet trucks are used as lifting tables to lift material from different heights. 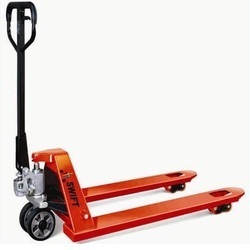 The Drum Handling Truck is one of the latest style pallet trucks. It has a good capacity to carry almost 660 lbs at one go. 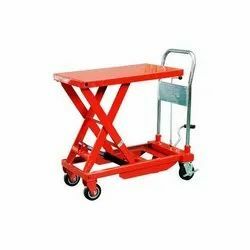 Average 55 gallons of steel drums can be lifted using the Drum Pallet Truck. This is a huge number of drums, considering the usage it can be put to in factories and warehouses. The drum truck can lift drums off from the ground at almost 4 inches. This aids in effectively moving the drums over other substances lying on the ground. However, the overall height of the drum truck is almost 47 inches. This is as measured from the top of the handle. There are steering wheels as well as load wheels. These wheels are made from nylon. The measurements and use of the nylon material differ for the steering and load wheels. 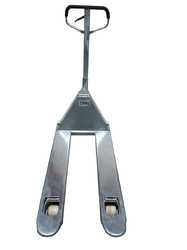 The pump handle aids greatly in maneuvering the drum trucks efficiently and lift, move and store the drums properly. We offer to our clients a Pallet Truck that has high load bearing capacity and is provided with nylon wheels for quiet and smooth rolling over rough surfaces. It is also equipped with a one-piece "C" section forks for greater strength and a sully strengthened chassis along inside of forks. Hydraulic Hand Pallet Truck manufactured by us is very popular in the industry. Its main use is in warehouses for swift transport of products like paper rolls etc from one place to another. We assure clients that there is no scope of for breaking, as use latest techniques and processes to shape the hand pallet truck. We offer three versions of this equipment. It is provided with castor wheels which have good load bearing capacity. Also, unique mechanism of the truck ensures swift movement between place, without any hiccup. You can control its fork lowering speed via a foot pedal and hand control. We are supported by state-of-the-art facilities to manufacture Hydraulic High Lift Pallet Truck. This material handling equipment is based on latest technology and helps in transporting of goods in the warehouse and similar establishments. The model of high lift pallet truck is provided in specifications of minimum and maximum fork height. The operator can adjust the height according to his/her requirements. It has an innovative design and the machine is assured to have the highest quality as it goes through comprehensive testing in our premises. This is a standard model and we can fabricate it as per the specifications provided by the customers. 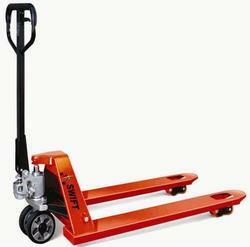 Accordingly, we can provide the hydraulic high lift pallet truck in different fork sizes, length, and width. Its pump design is all-inclusive and is characterized by leak-proof nature; eliminating the maintenance requirements as well as elevating the service life of the equipment. Its wheels are made of rubber, PU, Nylon as per client's suitability. We are offering Galvanized Hydraulic Hand Pallet Truck to our client.